The Muslim world has not been eager to hate America. For many Muslims, America with its religious freedom represented for decades a refuge against what all were pleased to call "godless Communism" and the USSR persecution of its Islamic republics. 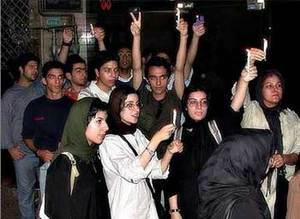 After the 9/11 attacks, there was a candlelight march in the streets of Tehran in mourning for the victims. American flags were waved. No flags are waving now. I visited Tehran once, in 1972, for the film festival. My Iranian guide took me home for tea with her parents. There was a point that her family members wanted to make. "We are not Arabs," her mother said. "We are Persians. We speak a different language. We are Muslims, but we are modern Muslims. You do not see our women covered up in the streets or locked up in their houses. America is our ideal, where all are left to worship in peace." Then the Shah was overthrown, and the fundamentalists took over. Moderate candidates have been elected to national office in recent years, but the ayatollahs have veto power over moderation. That was an Iran I hope still exists beneath the hostile stance they are taking against us. When we sent an army to Kuwait to throw back Saddam, Iran rejoiced, because Iraq was their ancient enemy. It was after we invaded Iraq after 9/11 that feelings began to sour. The sight of our occupation of a Muslim country disturbed the entire region. If we would invade its neighbor of our own volition, was Iran next? Until very recent months it seemed as if Iran was next. The White House reportedly ordered a military plan to be drawn up. Now we see the first light before a distant dawn. Although India has world's second-largest Muslim population, I am not naive enough to think the clerics in Hyderabad will bring a sudden change of feelings in the Middle East. But listen to a statement by the conference president. UPI reports: "He blamed Islamic radicals for their actions and the news media for failing to distinguish between the radicals and the majority of Muslims. 'We have no love for offenders whichever religion they might belong to,' he said. 'Our concern is that innocents should not be targeted and the careers of educated youth not ruined'." This is a moral statement from the core of Islam. 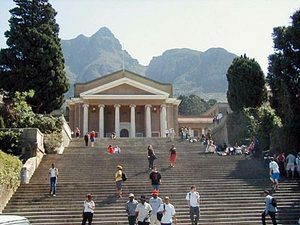 Now journey with me to South Africa, where I spent the year of 1965 studying English at the University of Cape Town. Because of historical guarantees, UCT admitted African, Coloured and Asian students. But it was a liberal island in the sea of apartheid. Every day I saw signs saying "Whites Only." "Nonwhites" rode in the back of the bus. They called me "boss." They made long trips to and from their segregated townships, by rail tracks that could be instantly blown up. 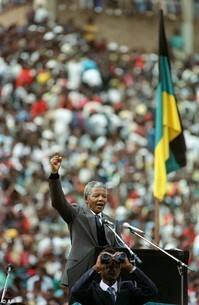 Nelson Mandela and his fellows were imprisoned on Robben Island, which could be seen from the slopes of Table Mountain. Remember that 1964 was the year Lyndon Johnson signed the Civil Rights Act, and famously said the Democrats had with that stroke of the pen lost the "Solid South" to the Republicans. There were more "Whites Only" signs in America than in South Africa. I spoke to no one of any race in South Africa who did not fully believe there would be a bloody race war. I had a Rotary Fellowship, and spoke to 30 Rotary clubs. In South Africa, the largely English-speaking Rotary was viewed in some circles as vaguely ominous. I traveled to Bloemfontein and Knysna, Windhoek and East London. Most of the nice, friendly, civic-minded Rotarians regretted the necessity of apartheid. But "you foreigners simply do not understand the situation on the ground here." If that was how the English-speakers felt, the Afrikaners felt more strongly. Originally religious exiles from Holland, they considered themselves the first settlers (the blacks, they explained, migrated from the north much later). Only the so-called Cape Coloureds had been on board almost as long--because their race, the joke went, came into existence nine months after the first white man met the first Bushman woman. Then something happened that no one could have expected. Apartheid stood on a theological foundation laid down by the Dutch Reformed Church, which virtually all Afrikaaners were born into. The church and the Afrikaner secret society, the Broderbund, were the great supporters of apartheid, not because it was racist, you understand, but because it was the will of God. Other Christian faiths (such as Archbishop Desmond Tutu's Anglicans) did not agree theologically, although many of their white followers went along with argument. But Afrikaners believed deeply in their Christian church's teachings. How truly deeply became apparent in the 1980s, when the church's theologians, after long debate, concluded that apartheid was morally wrong. The Broderbund listened to the theologians, and after much soul-searching, agreed. They didn't have to. The white state held the cards, and controlled the armed services. They did it because they became convinced it was the right thing. Then began a process by which President Frederik Willem de Klerk invited Nelson Mandela, convicted of terrorism and treason, to the first in a series of secret meetings, and requested him to join in an orderly transfer of power. 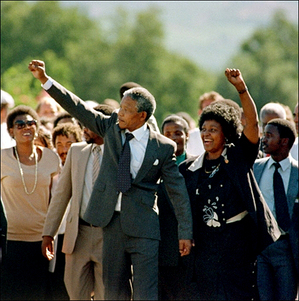 The sight of Mandela marching to freedom at the head of thousands of his followers, who were weeping with joy and disbelief, was one of the most inspiring sights of the century. There was a democratic election, and Mandela won as the ruling whites fully knew he would. For once God's followers decided they had been mistaken about his Will. In the early 1990s, Chaz and I traveled to Cape Town. It was arranged by our friend Anant Singh that we were met one morning by Amhed Kathrada, one of Mandela's fellow prisoners during the long Robben Island years. Soon after dawn, before the tourists-- tourists!-- arrived, he guided us through his old prison. Amhed Kathrada: "Oh, we enjoyed being slapped!" When we returned to Table Bay, "Kathy" took us to the Robben Island gift shop. "I want you to meet the shop manager," he told us. It was a white man. "He was one of our guards on the island." We greeted this man, a little puzzled. "He was the meanest, most racist guard of the whole prison. He would slap us and spit at us." I started to frame some lame words about forgiving them for they know not what they do. "He had to be mean," Mr. Kathrada said. "He got such a good reputation that they allowed him to stay on long-term. The other guards were rotated out if they grew to like us." "And now...he's the shop manager...?" Chaz began. "Oh, we enjoyed being slapped!" Kathrada said, and now he was smiling along with the manager. "This was the man who brought us our letters and took new ones away. He took out Nelson's book. He slipped us newspapers. And he smuggled in Nelson's new grandbaby for him to kiss and love. Slapping us was an excellent cover." There were very few violent reprisals, even though both sides had a very good idea of exactly who to target. Under the leadership of the heroic Archbishop Tutu, the Truth and Reconciliation Commission was formed. It held hearings throughout the beloved country, and its rules were firm: Confess fully what you did, who your victims where, and where their bodies might be found, in detail that the Commission members believed. Then walk away. Your crimes and your sins are now between you and heaven. Think about that. It was successful. The stature of Tutu, de Clerk and Mandela helped make it so. South Africans of all races, weary onto death of decades of violence, greeted the Commission almost thankfully. It is one of the most extraordinary stories in human history. Now it is 2008 and the clerics in Hyderabad have issued their statement. I am sure it will be taken up everywhere by Muslims and their leaders who have deplored Islamic terrorism, for it has no place in the theology of Islam. The Muslims I know are more afraid of terrorism than we are. Fatwa is their form of necklacing. They were watching TV when angry crowds shouted out that Obama was a Muslim. As if being a Muslim automatically made you guilty of something. Would those same angry people have once been willing to strike out against Jews, Methodists, Baptists, or Catholics? Many of our ancestors fled to America because so many in Europe were doing so. Now we open a new chapter in America, with a new President who looks just a little like everybody. Did you see Doonesbury the other day? Auth (c) 2005 The Philadelphia Inquirer. Doonesbury (c) 2008 G.B. Trudeau. Used by permission of Universal Press Syndicate. All rights reserved.